Ryota “Kazunoko” Inoue and Ryo “Dogura” Nozaki have faced one another many times late-stage tournament matches, not only in Dragon Ball FighterZ but also in Guilty Gear and Street Fighter. They are among the most accomplished competitors in the world today. Once both players had qualified for the Sunday night Dragon Ball finals, their matchup became one of the most anticipated of the evening, due in part to the backstory between the two greats. Kazunoko holds a slim 2-1 record against Dogura in the relatively young fighting game, and this finals match would provide the latter with a great opportunity to even things up after a pair of disappointing losses at Summit of Power and Community Effort Orlando 2018. Things looked rough for Dogura from the start. His best character, Kid Buu, is capable of mauling the competition, but he got caught almost immediately in a lengthy combo by Kazunoko, who ensured the pink fighter went down. 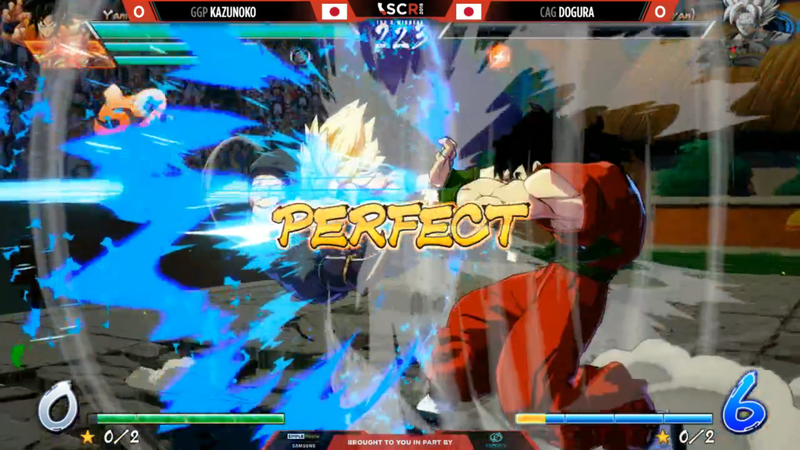 Then, as he smacked around Dogura’s second character, Kazunoko made sure to use Adult Gohan’s Potential Unleashed super, powering him up for the rest of the fight. Up to this point, Dogura hadn’t been able to hurt any of Kazunoko’s characters. As his first and second fighters fell to relentless beatings, Dogura just couldn’t seem to get a hit in. With just Super Saiyan Goku left, he would need to mount an miraculous comeback to secure the first game of the set. Kazunoko wasn’t about to let that happen. 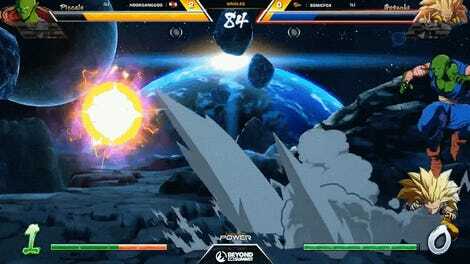 By combining Adult Gohan’s air pressure with Yamcha’s darting assist, Kazunoko was able to open up Dogura’s defenses and use the massive amount of resources he had accumulated thus far to pull off a huge, multi-super combo and close out the match. Throughout it all, he didn’t take on so much as a scratch. Perfect matches are always impressive, but pulling off a win without getting damaged by your opponent in Dragon Ball FighterZ is a whole other story. Similar to other team-based fighting games, Dragon Ball players must be cognizant of three characters at once: the one on the screen and the two providing backup. The game’s design makes it very difficult to ensure that none of these three characters get damaged at all over the course of a match. For example, when you call in a secondary character for a quick assist move, they’re vulnerable during that brief window of attack time on the battlefield. Calling them in at the wrong time is a good way to see their health dwindle. That lost life can be recovered, sure, but it’s not uncommon for ill-timed assists to result in bits of damage over the course of a match, and that means you won’t get a perfect score. Combine that with chip damage, or the damage that players take when blocking certain attacks, and the difficulty of this kind of performance becomes all the more overwhelming. Kazunoko succeeded in avoiding all damage by taking away Dogura’s ability to do much of anything. During most of the match, Dogura was either locked down by Kazunoko’s mixups or trapped in a lengthy combo. He just wasn’t afforded much room or time to mount his own offense at any point during that first game. And while Dogura found better footing in their next match, he would eventually lose to Kazunoko and fall into the losers bracket. They met again in grand finals, but Kazunoko again proved to be the better player that day, winning 3-0 and taking home the SoCal Regionals championship. Playing fighting games competitively is an exercise in experiencing the highest highs alongside the lowest lows. Earning a perfect game can be the most exhilarating feeling in the world, but being on the other end is frustrating enough to make one question why they even play at all. Kazunoko got the better of Dogura this weekend in a pretty major way, but you can bet he’ll enter his next tournament a little smarter for what he experienced at SoCal Regionals and ready to rumble.